14th Street Pizza in Islamabad, Pakistan. 14th Street Pizza Co. finally brings traditional hand-tossed New York Style Pizza for all the pizza enthusiasts in Pakistan. These oversized pizzas made with a rich blend of scrumptious toppings, homemade sauces and finest quality cheese which are baked to perfection on a New York style thin crust! 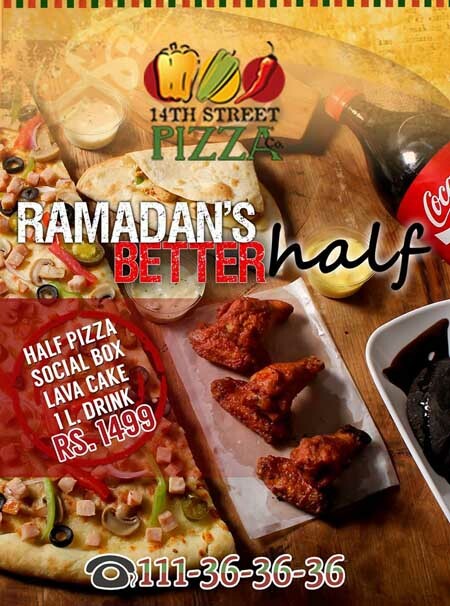 After a successful launch in Karachi, 14th Street Pizza Co. now introduces its popular pizzas to Islamabad. Enjoy the 20 inch thin crust masterpiece, where you can choose your own toppings and sauces ranging from mild to hot, so your pizza is just the way you like it. 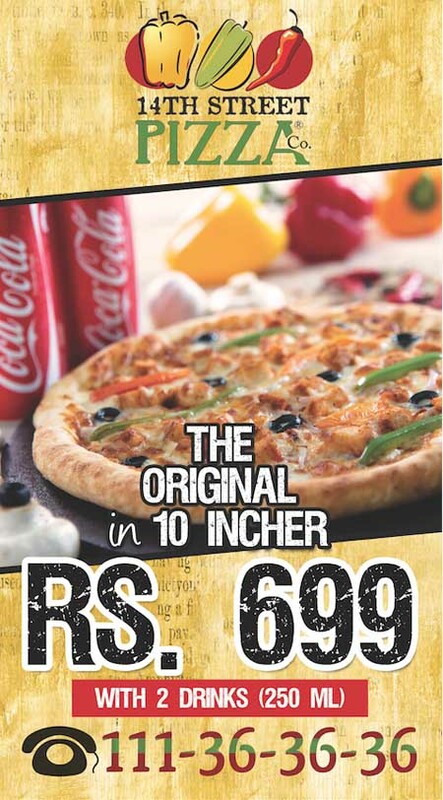 With a passion for pizza, 14th Street Pizza Co. strives to become the #1 thin crust pizza delivery option in Pakistan. Their mission is to deliver fresh and hot pizza to all the pizza lovers who have been waiting for something different and authentic. 14th Street Pizza Co. has introduced its unique pizzas through delivery, with the plan to open outlets in the future all across Pakistan. At 14th Street Pizza Co., the pizzas are prepared with the best quality ingredients available. Starting from the dough to sauce to cheese to chicken. They prepare the dough with their own special recipe, homemade pizza sauces which range from "mild" to "extra hot", also the cheese is imported from the best source available and the pepperoni is the best Halal product available in the world. At 14th Street Pizza Co., quality and consistency are of the utmost importance and they are excited to provide an exceptional pizza that had yet to debut in the pizza industry. 14th Street Pizza Co. is a highly experienced company in the food and beverage industry with other successful international outlet chains in Pakistan. They believe in providing quality food items and are excited to be able to provide an exceptional pizza that has been unavailable in Islamabad until now. Those who miss the real authentic New York Style Pizza can certainly expect a real treat. So order with confidence! You may have just found your new favorite pizza delivery in Islamabad. · Dips – Cheesy , Garlic Mayo , South West , BBQ, Garlic Butter & many more! Delivery Charges: Free delivery. Please allow approximately 50-55 minutes for delivery, as the pizza is an oversized 20 inch and will require some extra preparation and delivery time. Special Offers: Midnight Deals. Please inquire within for details. What to Expect: An extra large, cheesy pizza delivered right to your doorstep. Perfect for those wishing to try a new type of pizza in Islamabad.